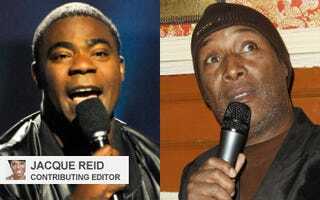 As comedian-actor Tracy Morgan continues the apology tour he embarked on after the public uproar over his homophobic comedy routine, there is something he said in the media that stands out for me. "I don't believe that anyone should be bullied or just made to feel bad about who they are," he said. Some comedians don't think Morgan should have apologized, because they believe that in the world of comedy, all is fair game. I disagree. I love to laugh, and I love a clever comedian. What I dislike are comedians who become bullies with a mic. Those are the ones whose routines go beyond just jokes. They're the ones who ridicule someone or some group in a manner that is mean-spirited and vicious. And Morgan is not the only offender. The only thing most people remember about this year's Golden Globe Awards was how mean the host, British comedian and actor Ricky Gervais, was to celebrities in attendance. The Los Angeles Times described his jokes as "snotty and abusive." In response, Gervais was unapologetic on Piers Morgan Tonight after the January telecast. "There's nothing you shouldn't joke about,” he said. "It depends what the joke is. Comedy comes from a good or a bad place, and I like to think that mine comes from a good place.” He added, "Just because you're offended doesn't mean you're right." In another memorably mean-spirited moment in comedy, Paul Mooney joked about Diana Ross' highly publicized DUI at the 2005 BET Comedy Awards. He went on to talk about Ross' ex-husband, who had recently died in a mountain-climbing accident. While Ross wasn't in the audience, her daughter, actress Tracee Ellis Ross, was there and had to listen as Mooney disgraced her mother and stepfather. It was so bad that the evening's host, Steve Harvey, took the stage after Mooney, told Ellis Ross to hold her head high and encouraged the audience give her a round of applause. Mooney's fans know that what he did onstage that night is his performance style. But it's his attitude about hurting Ellis Ross with his words that's the most disturbing. After his performance, he was asked if he knew that Ellis Ross was in the audience. "I didn't know," he said backstage. "Her mama could've been in there; that's not the point. I didn't drive drunk … No, comedy is not over the top. When you are a celebrity and you do crazy stuff, that's the game." Members of the Rutgers women's basketball team were not celebrities when they were called "nappy-headed hos” by radio host Don Imus in 2007. He was clearly trying to be funny, not malicious. But in the world of radio, where comedy plays a key role, funny can become mean real fast. Imus' comments outraged the black community, and he lost his job (only to land another one). Imus did apologize to the ladies, but there were comedians — even black ones, like my friend and former co-worker D.L. Hughley — who said that Imus had the right to say whatever he wanted. Another comedian friend of mine, Steve Wilson, agrees. "If it's smart and clever," he told me recently, comedians can say whatever they want. But what I've noticed about Wilson when he's onstage is that he is never mean. He says he was inspired by greats like Richard Pryor and Bill Cosby, who joked about themselves and their observations of life. "I don't have to attack the audience or other people when I have so much pain in my life to talk about," he said. Wilson adds that a lot of mean comedians are just projecting their pain onto other people once they hit the stage: "Hurt people hurt people." I imagine numbers, or dollar signs, factored into Morgan's decision to apologize. He might have been thinking specifically about holding on to that job on NBC's 30 Rock. But hopefully, as he takes this journey, he will broaden his perspective as well as his base of knowledge about people. Perhaps he'll realize that the type of joke he made about gays can only add to a climate of intolerance and hate that already exists. Surely some, maybe most, in the audience at Morgan's fateful Nashville, Tenn., show thought he was funny, but I am certain he can be even funnier and not hurt anyone in the process. Jacque Reid is a broadcast journalist and a contributing editor to The Root. Listen to her biweekly on The Tom Joyner Morning Show, visit her at jacquereid.com and follow her on Twitter.